I always like to try making own roti canai especially after read the recipe from 阿芳的3杯面粉 cookbook recipe. 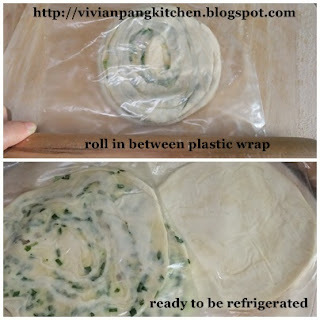 Her recipe is unique as do not need a lot of working space (no need to stretch into thin dough) and do not need to handling oily dough. Her method is some sort like chinese pastry making. The key for flaky pastry is from the oil based dough. I'm glad that I manage to have homemade flaky roti canai. Especially the one with seasoned green onion. Just omit the green onion if you prefer plain. It is great to eat with curry sauce. Although is not as crispy as "Mamak" store it is healthier. What do you think of my roti canai? * Mix when you about to use it. Mix all till well combine. Set aside. Rinse the green onion well then hang to dry. Cut into dice and keep inside fridge before used. 1. Add in the flour and warm water into kneading bowl. Knead till well combine. 2. Transfer to lightly floured working surface. Shape into ball. Cover and let it rest for 30 minutes. 3. 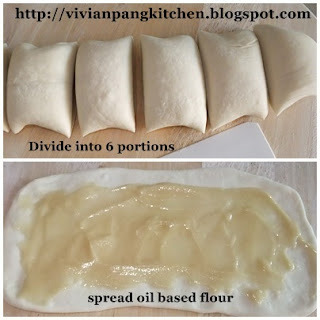 Divide the dough into 6 portions. Take a portion. Roll into rectangle shape (about 5x15cm). Spread 1/6 portion of oil based dough evenly on surface. 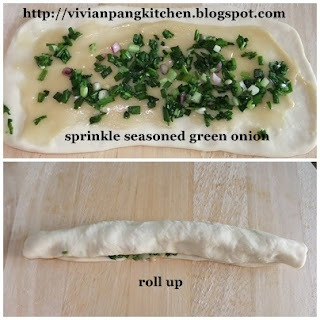 Sprinkle some seasoned green onion. Roll up like swiss roll. 4. Make 3-4 cuts along the roll. Lift up the dough with both hands and swing up and down to stretch the dough. 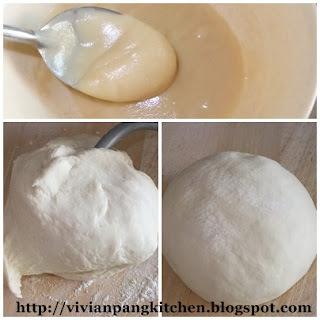 The dough is very flexible and easily extend as you swing. Stop once reach about 3-4 times of the original length. 5. 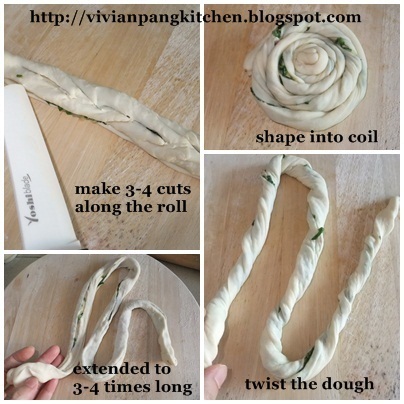 Twist the extended dough. Then make into coil shape. Keep aside to rest for 5 minutes. Repeat the same process for the rest of the portions. 6. Place each coil in between plastic wrap. Roll up into disc (about 18 cm diameter, 0.5cm thick). Keep into freezer for later used. *Since I'm not using any oil while working on the dough, the roti canai need to be freeze before pan fry. Or else it will stick on the plastic wrap as you remove. 7. Heat up a pan. Add some oil. Remove the roti canai from the wrapper (do not need to defrost) and place on the heated pan. Fry on low-medium heat till golden brown. Serve! This is great looking roti canai! oh, i can imagine the fun part when you swing it up and down!! I've been seeing this in Chinese sites for a long time, and never made it. WOw I think yours is very flaky, comparable to those mamak stores!! I love roti canai, and I never knew we could replicate it at home! Yes, the dough is easy to handle. No problem of stretching 3-4 times longer. Thanks. Actually it is called 葱抓饼 in the cookbook. Is fun to try on something. Do try. Sure. Thank you for sharing this wonderful recipe, it has made my life much more happy. Thank you so much for sharing. I cannot wait to make and freeze the roti as this is a big favorite among friends from all over the world. However, Vivian, since I am in San Francisco, I was wondering if the 1 cup measurement in the recipe is the same as US measuring cup? Thank you again. Love your blog! !